I admit that sometimes we leave our porch light later than we need to. It somehow seems friendlier to our neighbors to share a little light with the folks on our street, and only a few moths ever seem to get confused or distracted by the glow of the single bulb near our door. Of course, since we’re not the only family on the street to do this, the cumulative effect can be much greater than what we notice on our porch— scientists have been finding that humanity’s propensity to shine a light anywhere and everywhere is causing a lot of problems for animals that evolved to live under the darkness of night. The effects of light pollution aren’t always easily predictable, with some species behavior shifting dramatically depending on the exact amount of light they’re lit by. While we usually associate porch lights with moths alone, half of all insect species are nocturnal, so there’s a lot of possible outcomes from growing levels of light pollution. Parasitoid wasps like Aphidius megourae, for instance, like to hunt other insects like aphids in the low light of the evening. Researchers found that the wasps actually benefited from just a small amount of light pollution, such as from a town just over the horizon. Since most humans would like to keep the plants that aphids like to eat for ourselves, this may seem like an upside to light pollution. 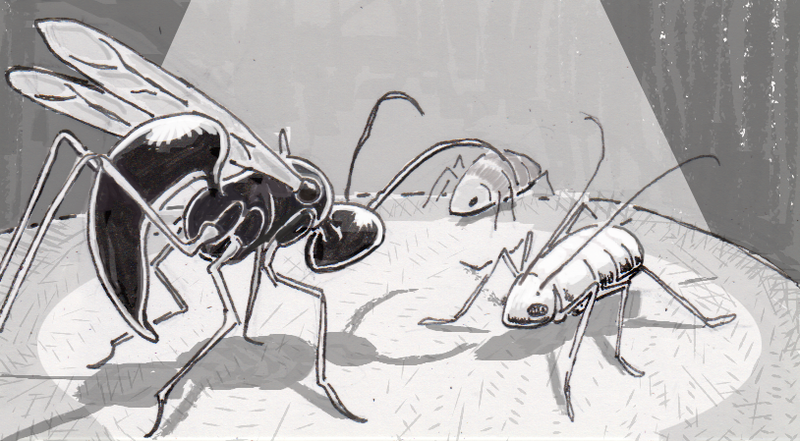 When light levels increased, however, the tables turned in the aphids’ favor. Brighter conditions made the wasps confused and distracted, making them incredibly ineffective hunters. This left the aphid populations unchecked, and exposed the wasps to risk of hunger and attack from other predators. Researchers worry that this relationship is just one of many possible problems faced by nocturnal insects around the world. More and more of the planet’s landmasses are being lit at night, and this is very likely stressing various ecosystems that sun-loving humans aren’t likely to notice until real problems develop. Insect populations are declining, which is quickly leading to issues with pollination and food sources of larger animals. As much as people prefer well-lit spaces, we should consider at least holding ourselves to the dim light of a nightlight if we want to help preserve these nighttime ecosystems.